Still fuming over the terrible burger from Grendel’s Den, I started walking down Massachusetts Ave towards a more reputable hamburger vendor, Mr. Bartley’s Burger Cottage. In retrospect, this is what I should have done in the first place as no matter where I looked, chowhound, blogs, or Urbanspoon the praise was endless; even Hamburger America by George Motz praised Bartley’s burgers as “unbelievable”. So, it should come as no surprise that even at 1 on a Tuesday afternoon, there was a still a line out of the door. After a quick wait and a chance to peruse the humorous menu, I was shown to a table amidst the chaos. It’s hard to know where to start at Bartley’s, everywhere I looked people were chowing down on a near endless variety of burgers. Although I was tempted to choose by name alone, I wanted a taste of a Bartley’s bacon cheeseburger. So, regardless of my opinion on the man, it was one Scott Brown for my table. A short while later, the senator’s namesake touched down. 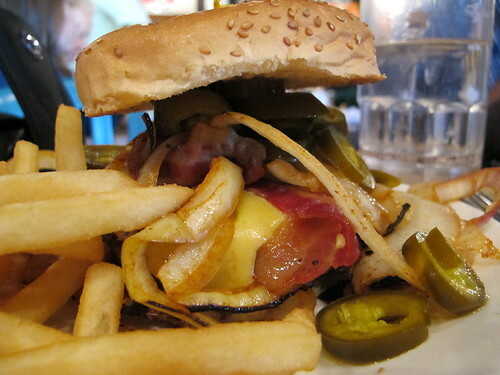 Served with a mountain of fries, this 7 ounce patty was ordered medium rare and topped with bacon, American cheese, grilled onions, and jalapenos. The fries, while well fried, crispy on the outside and fluffy within, were in need of a little salt, but that was easy to correct. Like Grendel’s Den, I have to fault Bartley’s for a poor burger to bun ratio. 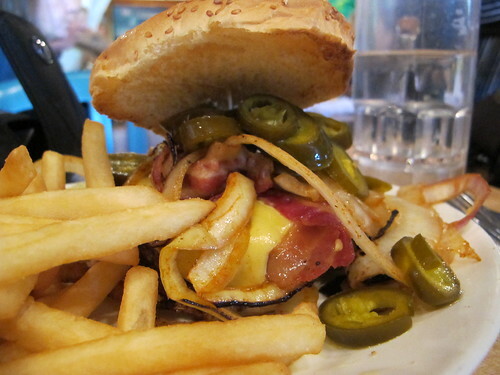 I do prefer when the jalapenos are incorporated into the patty, but there’s a charm to the thrown together look of this burger. 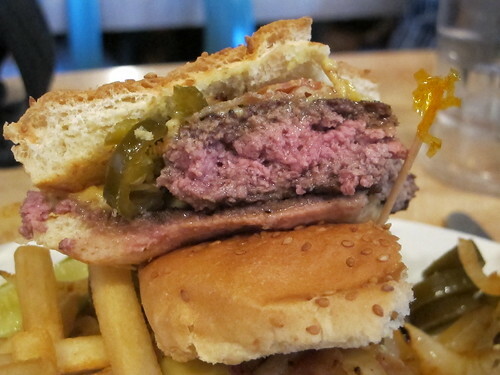 However, any grumblings about presentation were forgotten when I took a bite of this freshly ground patty. 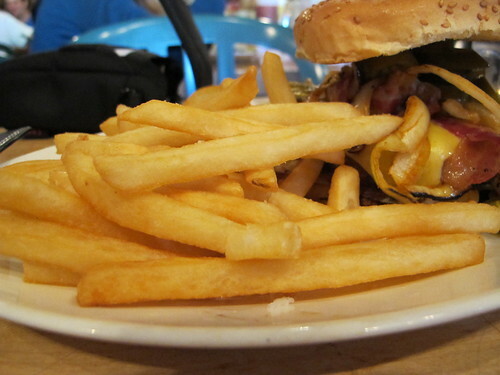 A thick, well seared crust, a beautifully medium rare middle, this cheeseburger was big, beefy, and unbelievably juicy. Any taste of bacon was lost in a sea of well-cooked beef patty and cheese but this was burger simplicity attaining its near perfect form. Leaving behind little more than a small pile of fries and a grease spot where my burger used to be, I was able to snap a picture of what helps make Bartley’s burgers so great. A well seasoned griddle, 600 degrees, and a little bit of weight, it’s the stuff burger dreams are made of, and the pile of sautéing onions isn’t bad either. Needless to say, any ill will I hade built up towards Grendel’s Den was vanished by the sublime products of Bartley’s Burger Cottage. I only wish I had eaten at Bartley’s first if only to try more than one of their burgers and maybe one of their shakes. 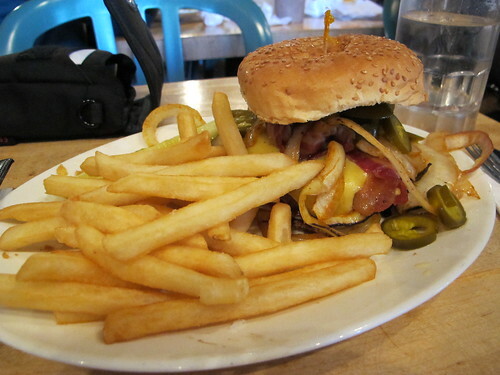 Regardless, the next time I’m in Boston, the first and last thing I will do is pay a visit to Bartley’s, just to get a taste of burger nirvana. R.F. 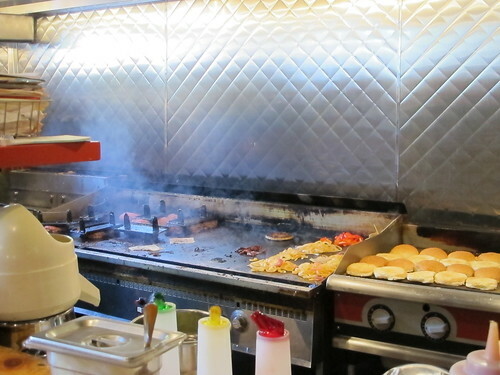 O'Sullivan's, about a 5 minute walk off Harvard campus, also has excellent burgers. People I know generally prefer O'Sully's to Bartley's. Another local place to try is Christopher's for their pepperjack burger w/chipotle mayo- the mayo also goes well with their fries, which I think are the best in town. Their "assorted nachos" are also very good. A local restaurant of a different sort that's worth trying is The Friendly Toast, near Kendall.